Only two life forms exist at the end of time: cockroaches and the Time Trapper. Obsessed with eradicating the Legion of Super Heroes, the Time Trapper tried to make the Legion forget Superman. That didn't work. So now the Trapper pulls Superboy-Prime out of the time stream and flings him into the 31st Century. Superboy-Prime lands on a 31st Century farm in which an elderly couple is seen watching a news report about the continuing xenophobia toward extraterrestrials on Earth. The elderly man fires a futuristic rifle at Prime who uses his heat vision to completely disintegrate the elderly couple. Prime realizes quickly he's in the future and he comes upon the Superman Museum. Prime unwittingly activates a hologram of Jimmy Olsen to serve as his museum guide. He's taken on a lengthy tour on which Prime learns that history barely considers him more than an annoyance to Superman over his career. And he's really peeved that history remembers Connor Kent's legacy as Superboy much more than his own as Superboy-Prime. Prime learns about the Legion, though, as a denizen of Earth-Prime pre-Crisis, he tells the holo-Jimmy he read "Legion" comics as a kid and knows all about them. The Science Police arrive. Superboy-Prime freezes them with his super-breath and throws a tantrum. "It's not fair! It's never been fair! ", Prime yells. Then holo-Jimmy begins to tell Prime about the Legion of Super Villains so he goes to seek out their three most powerful members. Meanwhile, the United Planets Council argues with Legion founders Saturn Girl, Cosmic Boy, and Lightning Lad. They are arguing over whether the Legion's UP charter should be rescinded. The argument mirrors the xenophobia gripping Earth. Some argue the Legion proves that a united universe doesn't work, others simply embrace what they see as the inevitability of xenophobia among different alien cultures. In the Phantom Zone, Legionnaires Phantom Girl, Lightning Lass, and Shadow Lass recover Mon-El who'd been placed into the Zone again by Earth-Man (a few months back in "Action"). Zod almost escapes from the Zone. Upon being released from the Zone, Mon-El's lead poisoning returns. Brainiac 5 re-administers the anti-lead serum he invented. Mon slowly begins absorbing yellow solar energy (Daxamites work like Kryptonians in terms of how they process yellow solar energy). Meanwhile, Sun Boy sits alone in the dark. He feels violated by what Earth Man's Justice League did to him (they siphoned him as an energy source). Polar Boy tries to convince him to rejoin the fight to save the Legion but Sun Boy says he's burnt out. Back at the UP Council proceedings, the Legion's dissolution seems a certainty. Suddenly, Legion founder R.J. Brande returns from an extended absence. Brande commands immense respect and the UP Council is ready to hear Brande speak on why the Legion must be allowed to continue. Back at the Superman Museum, holo-Jimmy teaches Prime about the Takron-Galtos prison planet. Prime invades it and frees Lightning Lord, Saturn Queen, and Cosmic King. Prime learns that they know who he is and that he is their inspiration. According to Lightning Lord, it was always hoped Superboy-Prime would lead their legion to victory - their legion being every villain contained on the prison planet. Brande speaks to the Council. He argues that Superman owes his value system of truth, justice, and the American way to the Legion training he received in his youth. Suddenly Leland McCauley, a rival to Brande, shoots and kills him. In front of everyone, it's revealed that R.J. Brande has always been a Durlan in disguise - a shape-shifter, not a human after all. McCauley grows old and withers to dust in front of the Legion's eyes (courtesy of Time Trapper). The Legion appears to be unraveling. An alarm signal goes off. When they see what the alarm's about, they immediately put out a call for help to the 21st Century -- to Superman! The emergency call activates Superman's flight ring and opens a time warp to the future. The Legion show Superman that his insignia has been burnt into the very surface of the Takron-Galtos prison planet. Every villain is free. More than 20,000 guards and staff are dead. Superman gets a look at the culprit: Superboy-Prime. He tells the Legion all about Superboy-Prime. Realizing that they're facing potentially a Superman-level threat from a parallel world, Brainiac 5 suggests they call on two parallel versions of the Legion of Super Heroes themselves for help. Superman says they must do something drastic to stop Superboy-Prime. Kill him, asks Lightning Lad? No, Superman answers, they have to try to find the good boy who helped Superman during the first Crisis and redeem Superboy-Prime! Story - 5: Now here's a Crisis worthy of the word and the capital "C". It's becoming quite tedious to write that Geoff Johns is an incredible writer with a real sense of how to plot a story. Fans joke that Johns should be writing every DCU title and it's stories like this that buttress that point. Grant Morrison, the writer of "Final Crisis", writes like a painter, each stroke having meaning and each stroke adding to the whole. For that reason, he writes a whole different type of Crisis than Marv Wolfman did with "Crisis on Infinite Earths". Wolfman's "Crisis", even with a one year set-up of Monitor appearances throughout the DC Universe, brought an immediate sense of impending doom from issue one. Morrison's "Final Crisis" creates a sense of creeping doom (though, with the most recent "Final Crisis #3", the doom has fully crept in and then some). For those who were missing a grandiose sense of soap operatic sprawl to their "Crisis", along comes "Final Crisis: Legion of Three Worlds". Johns understands that two different kinds of fans will be approaching this title: Legion fans and non-Legion fans. The Legion fans - particularly those who've come to the Legion since DCU crossover "Zero Hour" in the mid 1990s - may need to learn a few things about the 21st Century DCU, Superman, and Superboy-Prime. The non-Legion fans, on the other hand, need a concise Legion primer. Johns brings both types of fans up to speed quickly. Even with all the exposition required to bring two different classes of fans together, Johns keeps the story moving and - unlike a lot of recent first issues - things actually happen. This is more than just a trailer for the next four issues. Threats are revealed - at least to the readers - right off the bat: the Time Trapper and Superboy-Prime. Brande is assassinated. He's revealed to be a shape-shifting Durlan. And no, this isn't a rip-off of Marvel's Skrulls - Brande had long been known to the original Legion as being Durlan; it's the revelation of his true identity to the public at large that adds to the Legion's problems. In a book whose title forecasts the story of three different Legions, Johns shrewdly focuses on only one Legion for most of the first issue: the original Legion. A very rudimentary history lesson for the uninitiated: The Legion began as Superboy supporting characters in 1958's "Adventure Comics #247". Superboy and Supergirl were Legion members. Jimmy Olsen, Lana Lang, and Pete Ross were all recognized at one point or another as honorary Legionnaires. Even though Superboy appeared in most Legion stories, the Legion quickly became fan-favorites independent of the Boy of Steel. The first "Crisis on Infinite Earths" and the "Man of Steel" reboot by John Byrne erased Superboy from DCU history retroactively. Without Superboy to connect the 20th and 30th centuries, the Legion lost its very raison d'etre. Then came DC crossover "Zero Hour" in 1994. "Zero Hour" was intended to be another big Crisis-level reboot. It revealed Hal Jordan as the reality warping Parallax. It introduced Jack Knight as Starman. And it rebooted the Legion of Super-Heroes from scratch into the Legion pictured on the penultimate page of this issue. As far as reboots go, this was a pretty successful one that managed to reintroduce the Legion, re-tie them to the late 20th century (first using Mon-El/Valor as a tie to the 20th century, and ultimately using Barry Allen's grandchildren, cousins XS and Impulse, to tie the two eras together), and expand the Legion legacy with new characters like XS, Gates, and Thunder. Ultimately, sales declined. Lastly, there is the most recent incarnation of the Legion. Mark Waid rebooted the Legion once again in 2005. This is the current Legion whose adventures are currently being written by Jim Shooter. This Legion doesn't exist in a utopian future like previous incarnations. The future technologically driven Earth of this Legion has become lazy and apathetic. This Legion is presented as 31st Century teen-age rebels to the status quo. This is the Legion that Superman's cousin Supergirl joined for a brief time in the 31st Century. This is the Legion pictured in the big panel on the last page of this story. 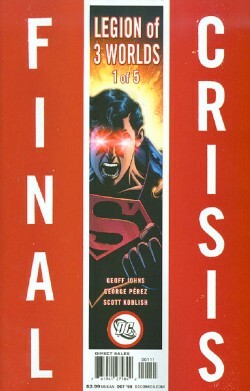 For Superman fans, there's a lot to love about this book. Even though the Man of Steel is only called to the future four pages prior to the end of the issue, Superman's legacy is felt throughout the entire issue. Superboy-Prime slams to Earth in Smallville, U.S.A. where he's found by an elderly farm couple who more than resemble - physically anyway - Jonathan and Martha Kent. Prime is met with fear and gunfire whereas Kal-El was immediately met with love and respect. The two-page spread of the Superman Museum rocks as both a piece of art (see my art review below) and as yet another piece to the modern reconstruction of Superman continuity. The museum showcases not just the most familiar Superman but also showcases the Golden Age Supes, the 853rd Century Superman, the Kingdom Come Superman, and the Tangent Universe Superman, among others. It establishes both Superman's nuclear and extended families. It re-establishes Conner Kent's role as Superboy. It reintroduces Superwoman as a yet-to-be-reintroduced member of the Superman Family. Also, by re-embracing Jimmy's Silver Age transformations, the story could be seen as un-doing Jimmy's role in "Countdown to Final Crisis". Finally, it's great to see the name "Superboy" in modern DC comic books again. It hasn't been used to identify young Superman yet but it is being used again for Prime and Kon-El. DC publicly is saying that these are different Superboy characters than the one who is the subject of the lawsuit with the Siegel family heirs. Still, there was a time when DC didn't use the word "Superboy" at all even for those characters. Whatever the reason, it's a positive step forward to see that DC's lawyers have loosened up even a little bit by backing off the total embargo on the word "Superboy". Take the next step DC and Warner lawyers and settle the case already. Art - 5: A huge part of why this feels like a "Crisis" is George Perez. The artwork gels so well with the story, you'd think Perez was drawing for Marv Wolfman here. Geoff Johns and Perez rivals Wolfman and Perez in terms of writer/artist chemistry. Johns gets that, with the kind of hyper-realistic art you get from George Perez, cockroaches are the perfect way to start things off on a really ultra-creepy note. The two-page splash of Prime looking into the Superman Museum is a stunner and worth the price of admission for any Superman fan. It's only one of at least three splash panels that would make gorgeous posters. Cover Art (Superboy-Prime) - 3: I really like this cover and it would've/should've gotten a 4 or 5 easily. But all the main and ancillary "Final Crisis" books' primary covers have these grossly imperfect brick-red vertical borders. Not only is the sameness getting boring but so are the sporadic white dots all over the frame on every one of these "Final Crisis" books. This printer error should've been rectified the second that the first issue of "Final Crisis #1" returned from the printers. To borrow Superboy-Prime's battle-cry - "It's not fair!" And I'm taking it out on Mr. It's Not Fair himself. If you don't like it, Superboy-Prime, lump it. That's what your whiny battle cry is for. 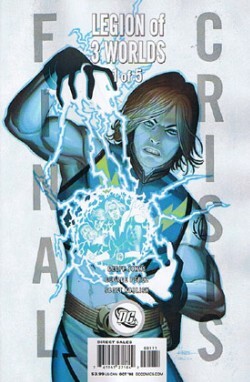 Cover Art (Lightning Lad) - 5: This one's truly for the Legion fanboys and fangirls. This is the advanced cover for those who know their Legions and would want a really cool George Perez-rendered Lightning Lad over a Superboy-Prime cover. Perez doesn't pull any punches and Hi-Fi makes a much cleaner printing partner for the end-result. To quote one of my favorite movie musicals - "It's electrifying!"